Mesmerized by these two women, Harry finds himself falling deeper under their spell. Yet the closer he gets to them, the more isolated he feels, disoriented by a growing fear that both women are hiding dangerous—even deadly—secrets... and that neither one is telling the truth. Told from multiple perspectives across more than twenty years, this is an intense, mind bending thriller. In the present, Harry finds himself caught up in his father’s murder investigation. In the past, we get moments in time from the perspectives of a few different characters. Like all good psychological thrillers, readers are able to piece together each of the seemingly discordant scenes to find the killer before the final revelation. I’m always in two minds about books with unreliable or unlikeable narrators. This story has both and while I enjoyed the moral ambiguity, I’m not sure I wanted to get so far into the minds of a couple of the narrators. Harry himself is too bland for readers to either like or dislike and it is impossible to view any of the other characters without suspicion. The result is a tense and often ugly search for truth. I don’t want to give anything away, but something about the ending felt both too easy and slightly unsatisfying. However, I’m not sure any ending would be completely satisfying because this is a story that prompts far more questions than it could ever answer. I’m not sure I enjoyed the book but I loved the puzzle and I honestly couldn’t put it down. Harry has a mystery on his hands. With the death of his father, he comes home and now has a mystery to solve. His stepmom is hiding something, his family friend is hiding something, and there is a new person hanging around who is trying to solve the same mystery as Harry, but for a very different reason. This has a great mystery. While I wish that Harry had more personality, his flashbacks were helpful in figuring out part of the mystery. I really liked his friend, and wished he was more part of the story since he gave off more personality and flare than Harry. Without giving away the mystery, you could see it play out slowly and like a train wreck you can’t look away from, despite the predictability, it was still entertaining. 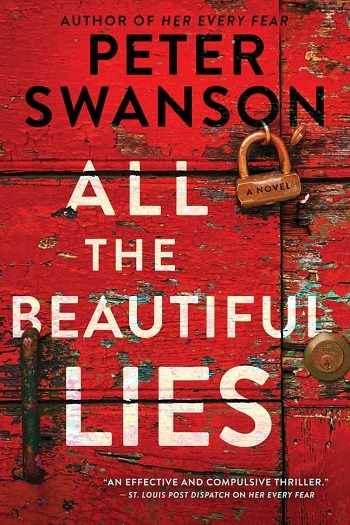 Reviewers on the Wicked Reads Review Team were provided a free copy of All the Beautiful Lies by Peter Swanson to read and review.